This page compares Capacitive sensing vs optical sensing and describes difference between Capacitive sensing and optical sensing. 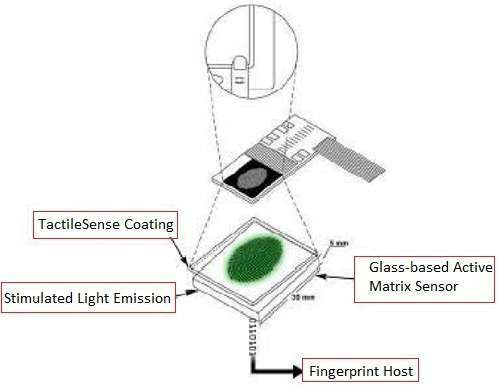 There are four main types of sensing techniques used in biometric identification which include optical sensing, thermal sensing, capacitive sensing and ultrasound sensing. In this page we will provide comparision between capacitive and optical sensing techniques. • Fingerprint consists of tightly spaced ridges and valleys. • As shown in the figure-1 sensor consists of a capacitive array. 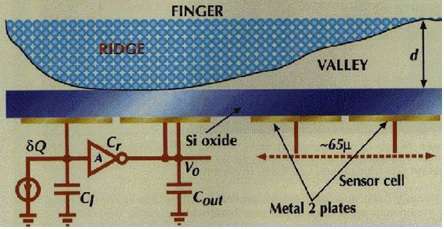 • The capacitive array acts as one plate of a capacitor while the finger acts as the other plate. • Each pixel in the array is charged charged to reference voltage which are allowed to discharge with reference current. • The rate of change of potential at each pixel is proportional to capacitance seen by the array. Iref = C*dv/dt This principle is used in the design of capacitive sensing. 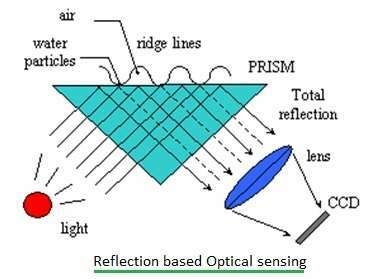 Let us understand principle used in optical sensing technique. • As shown in the figure-2 finger touches light emitting tactilesense polymer. • Photodiode array embedded in the glass detects illumination. • Image is captured and transferred for storage. As shown in the figure-3, sensing is done by projecting image of fingerprint onto camera by total internal reflection. Following points further summarize comparison between capacitive sensor and optical sensor types. -Large sensing area since manufacturing large pure silicon chips is very expensive. -More robust and longer life.